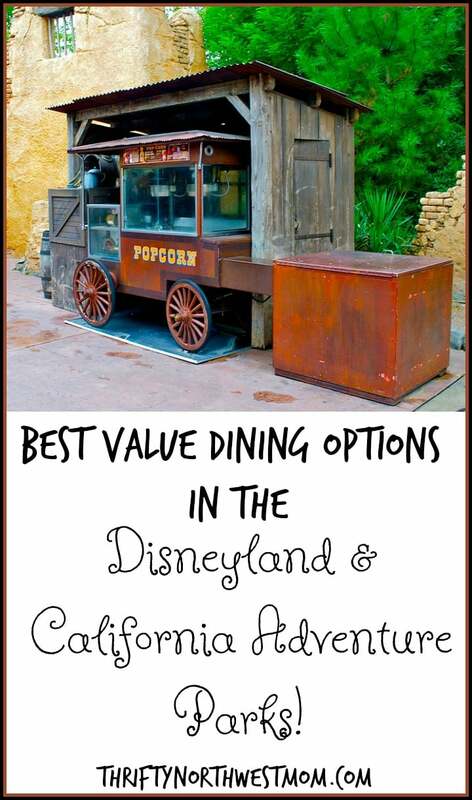 Best Value Dining: Disneyland (Which Restaurants in the Parks To Eat At)! Disneyland is filled with thrills, magic and fun. However, a large part of what makes Disneyland The Happiest Place on Earth for me is all of the delicious food. What’s nice about the meals at Disneyland is that you don’t have to sacrifice all your money for quality food. If you are looking for the best value dining, Disneyland has some options we share here. They have a wide variety of places to eat, which makes it easy to find something for everyone in the family. Because of this, I’ve partnered with Get Away Today to give you a guide on the best value restaurants inside the Disneyland Resort. While eating your own food, or having a hearty breakfast at the hotel are all great ways to save, sometimes you are in the parks and just need to know where some of the most economical places to grab a bite are. We have included some of our favorites. Let us know if you have a tip on how to keep your costs down eating in the parks that we missed. Best tip for eating and drinking in the parks: Ask for a water at the areas that serve fountain drinks. It is FREE! Otherwise you can pay upwards of $4 or $5 for a bottle of water. Walk Up Counters will save you quite a bit over sit down restaurants: And often times they will even have some of the same menu items as their counterparts. My favorite thing to do with the counter service spots is find one with the ambiance I like (like sitting along the river) and then getting a table, ordering from my mobile app, and picking up when ready. It makes it just about as convenient as table service, but at big savings! Download the app to check out menus and prices ahead of time: This way you will know if there are things your family will eat, things you might be able to share to save more, and what the prices are. You can even place orders directly from your phone, and then pick them up without the long wait lines. Eat Lunch rather then Dinner at Sit Down Restaurants: If you want a nice meal at a sit down restaurant, consider the lunch menu over the dinner menu. It is often much more affordable. I highly recommend making reservations on the Disneyland app (or you might not get in)! I look for the latest lunch reservation, and save some money that way. Now for recommendations on specific restaurants in the parks to save at! Boardwalk Pizza & Pasta: Boardwalk Pizza and Pasta is probably one of the most underrated places to eat in California Adventure. Not only do you get delicious Italian food, but you get a large portion of it for a small price. While we love their pizza slices, I think their pasta dishes are where they really shine. Here, you can choose between Chicken Sun-dried Tomato Pesto, Five-Cheese Ravioli or the classic Spaghetti with Meatballs combo. Plus, you don’t have to feel like you’re eating greasy or heavy food when you eat here. The “pasta”bilities are endless when you eat at Boardwalk Pizza & Pasta! Flo’s V8 Café: Flo’s V8 Café is a hidden treasure nestled in the back of Cars Land, across from the Cozy Cone shack. If you’ve never tried this Route-66 inspired diner before, you’re missing out. It is themed like a gas station, and although it is counter service, it feels like a real diner. This restaurant is open for breakfast, lunch and dinner, so you can eat their American comfort food all day long. Choose between Brioche French Toast, BBQ Pork Ribs, Turkey Dip and so much more. 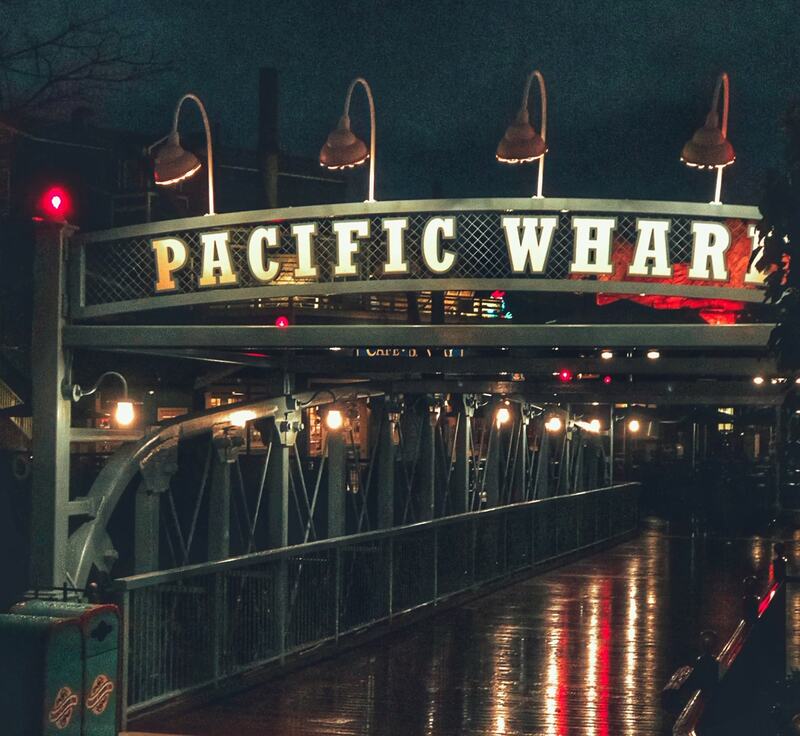 We always make a stop here for a meal during our Disneyland California Adventures! 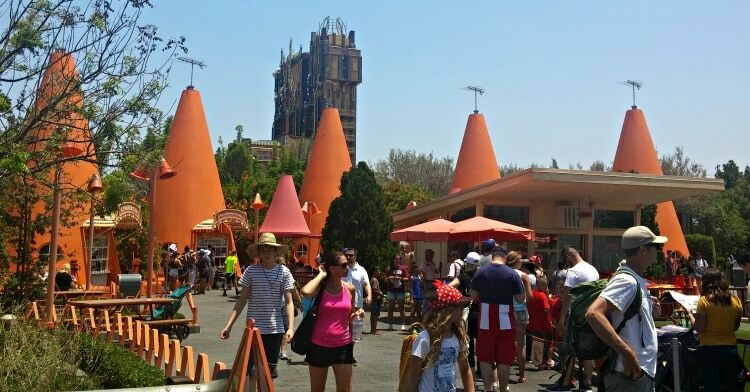 Across from Flo’s is the Cozy Cone Motels. 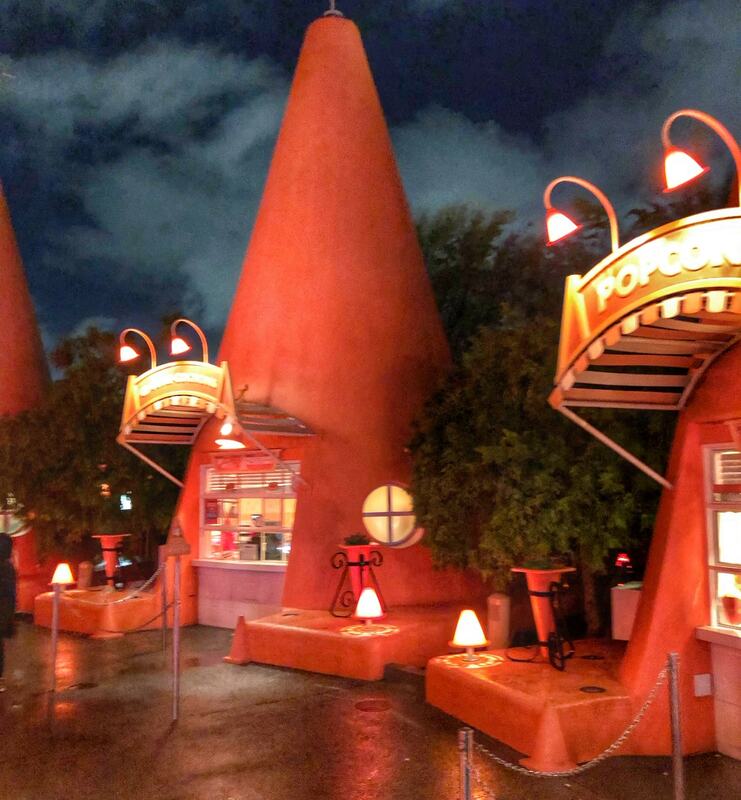 These are walk up windows where you can get ice cream cups big enough to easily share with two people, or different kinds of food in a cone (chili, popcorn, etc). Its a quick and easy snack, that you can share, to hold you over until meal time. The value of these quick service items, is that they are big enough to share. If your not prepared to share, they won’t save you much (vs a meal at a counter service spot). 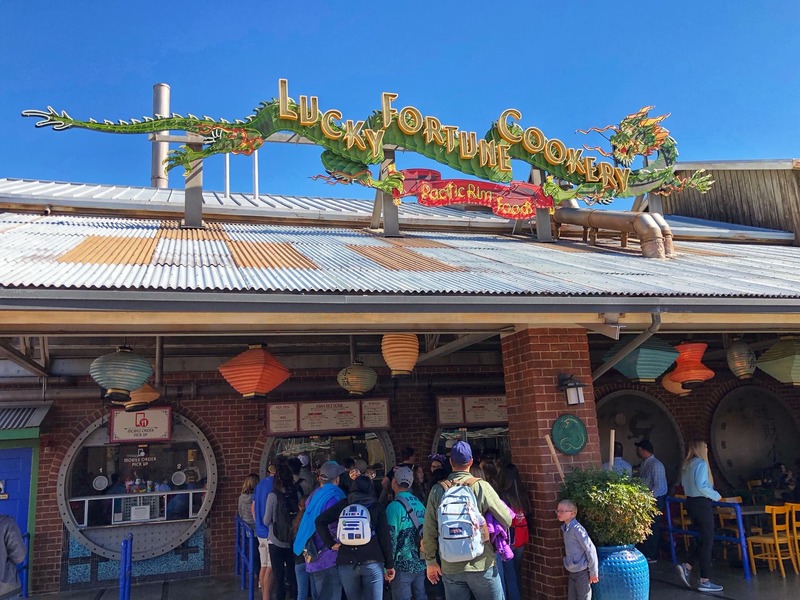 Lucky Fortune Cookery: Located on the Pacific Wharf, Lucky Fortune Cookery is a great place to eat for a satisfying meal on the go. You can choose between beef, chicken or tofu in a made-to-order Asian rice bowl. Plus, you can choose between Mandarin orange, Spicy Korean, Thai coconut curry and Teriyaki sauce to give your taste buds a kick. These bowls also come with seared Asian vegetables and steamed rice. It’s your lucky day if you get to dine at the Lucky Fortune Cookery. 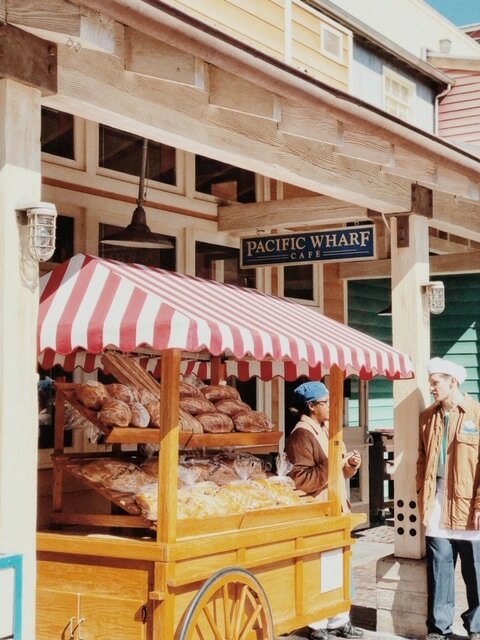 Pacific Wharf Café: Also located in the Pacific Wharf is the Pacific Wharf Café. Inspired by San Francisco eats, this is probably the most popular spot to eat at in California Adventure and for good reason. Here, you can get a Turkey Pesto Club, Chinese Chicken Salad and their famous Broccoli and Cheese soup in a Sourdough Bread Bowl. The best part? You can get Macaroni and Cheese or their famous salads in a Sourdough Bread Bowl if you’d like. 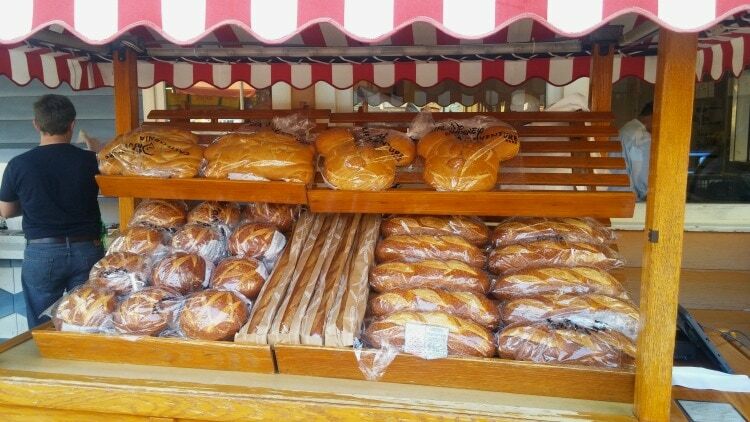 You can also buy one of the loafs of their sourdough bread, and share it with the family, for an even more economical snack. Bengal Barbecue: The Bengal Barbecue doesn’t get enough credit, because it’s a delicious spot to get great food at an amazing price. This quick service restaurant serves spicy or sweet beef, chicken, or vegetable skewers. Plus, the skewers are only $4.99 each, so you can easily get two if you’re still hungry. This restaurant also serves Spring Rolls, a Hummus Trio and Tiger Tails Breadsticks. 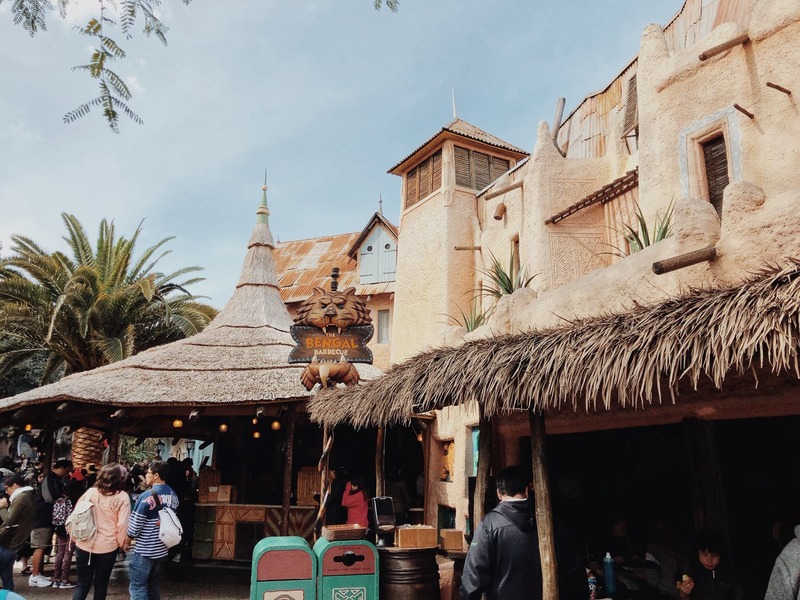 If you’re looking for something to do before riding Indiana Jones, make sure to stop for a bite to eat here. Jolly Holiday Bakery Café: At the end of Main Street U.S.A, you’ll find this charming Mary Poppins-themed eatery with fresh food and delectable treats. 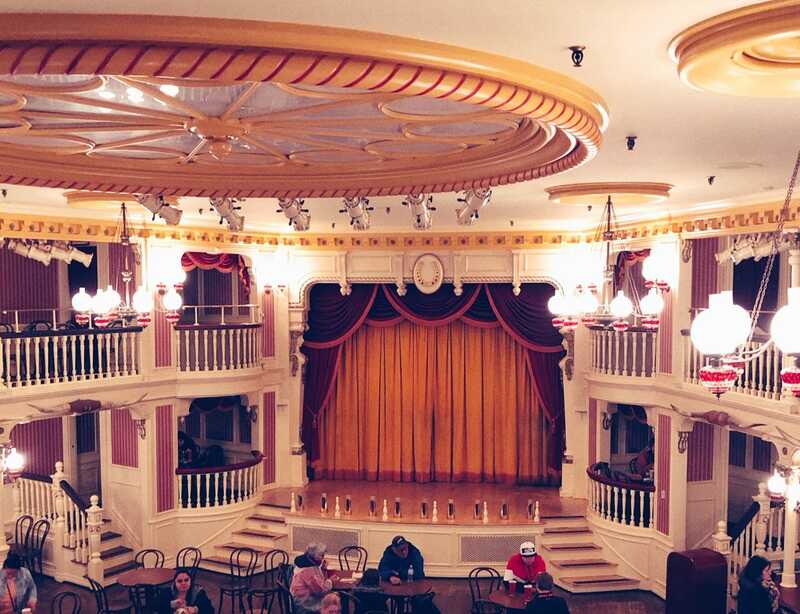 Their most popular dish is the Jolly Holiday Combo, which includes a Grilled Cheese sandwich and Tomato Basil soup. I love eating this on one of the chillier nights at Disneyland, because it’s sure to warm you right up. If you’re not a fan of Grilled Cheese or Tomato Basil soup, don’t fret! You can also choose between an oven-roasted Turkey sandwich on Ciabatta, a Roast Beef sandwich or a Grilled Chicken and Apple Pecan salad. However, my favorite thing to get at the Jolly Holiday Bakery is the Raspberry Rose Macaron. This macaron can easily be shared between two people; however, you might want to get your own because of how delicious it is. Stuffed with raspberry filling and fresh raspberries, you’ll never want another treat at Disneyland after this one. There is plenty of seating right outside this cafe too! 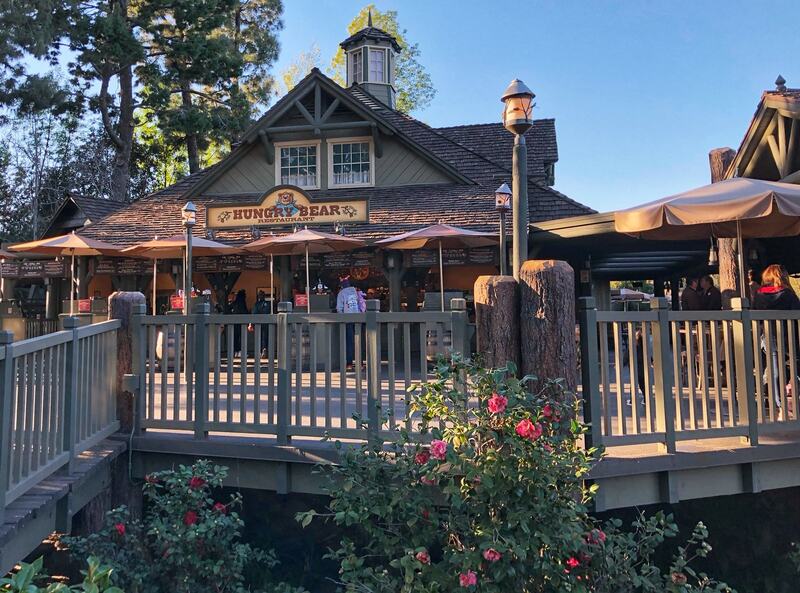 Hungry Bear Restaurant: If you’re in Critter Country and looking for a place to grab a bite, make sure you head over to the Hungry Bear Restaurant. Here, you can get classic American food with a twist. Choose between a Turkey Caesar wrap, Crispy Chicken sandwich, a Chili Cheeseburger and more. However, my favorite thing to get at the Hungry Bear restaurant is the Teddi Barra Lavender Sparkler. This drink comes with lavender and elderflower syrup, lemon juice and carbonated water and is sure to refresh you during your Disney day. One of my favorite things about eating at this restaurant is the view. You can eat out on the deck with a water view (self seating). 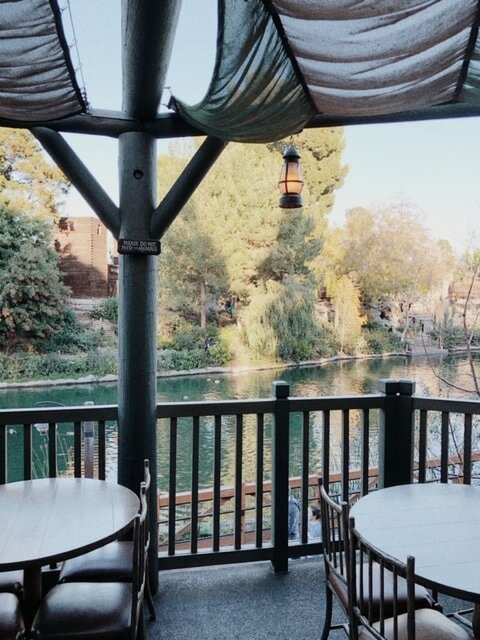 Its cooler then some of the other spots, and I always imagine what it might cost me to eat at a restaurant with a view like this outside of the park. Stage Door Café: Last, but certainly not least, my absolute favorite thing to eat inside Disneyland is their famous corn dogs. 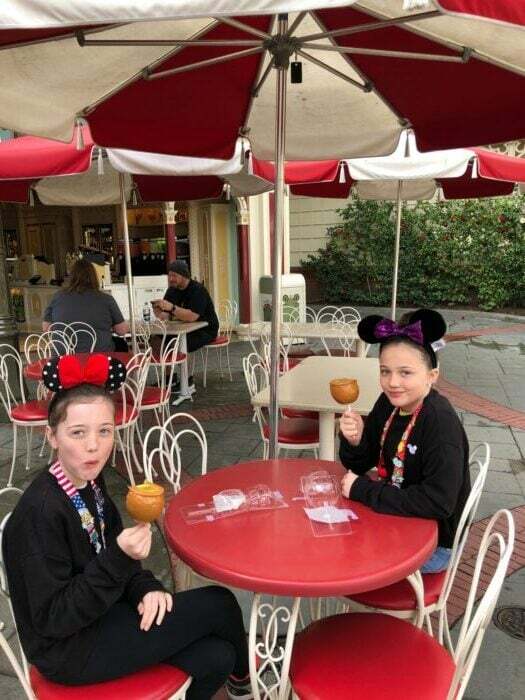 While there are two other restaurants to get corn dogs throughout the park (Corn Dog Castle and Little Red Wagon), you’ll want to make sure to get yours at the Stage Door Café. Not only is it less expensive here, but you also get the option of having fries with your corn dog, instead of the usual potato chips. 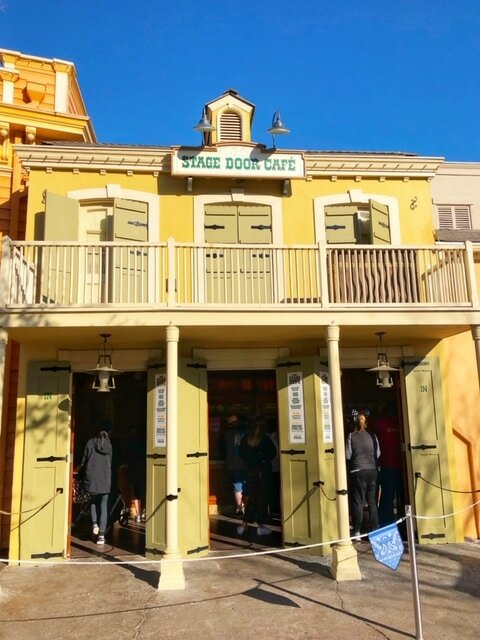 The Stage Door Café is located in Frontierland and is well worth your time to try. 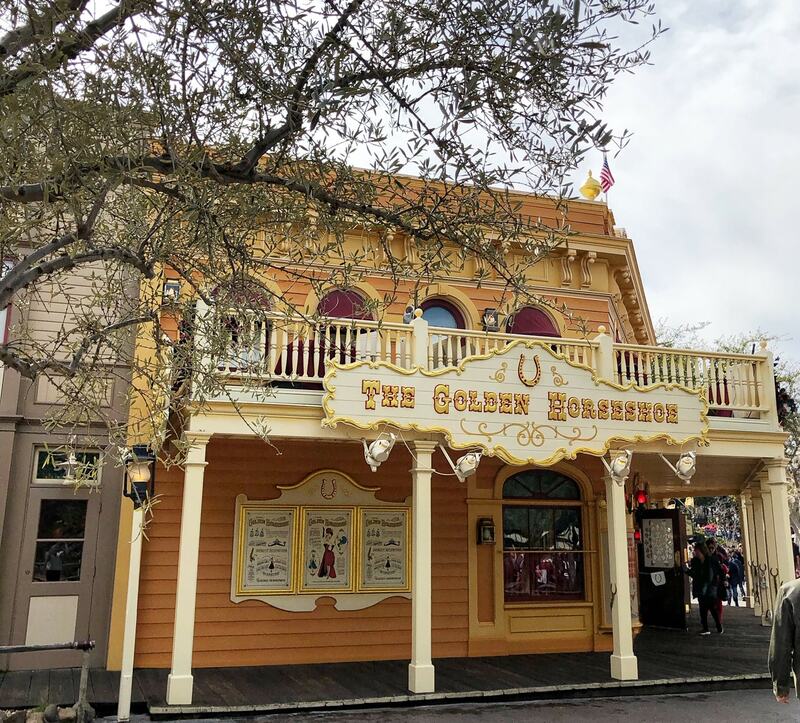 Right next to the Stage Door Cafe, is the Golden Horseshoe. They offer live entertainment throughout the day, so it is a fun spot to relax for a break, in an air conditioned spot. We often stop in here for a side of fries, or a sundae to share (three of us split one) and watch the show. 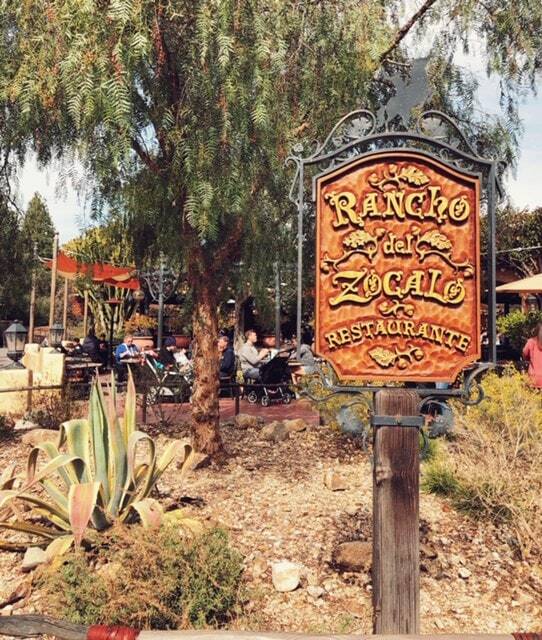 Rancho Del Zocalo is usually popular with lots of people. The line can look long, but there are actually three lines you can get into (and for some reason the salad line is usually always short). So bypass the long lines outside and walk up to the salad counter for a salad large enough for two to share. You can also head to the salad counter, and get a side of chips and salsa and guacamole (chips where $2.99 and guac and salsa where $1.49 each on our recent trip here). Plus, this spot has a water wagon out in the seating area, so you can easily get water and water refills to save big on drinks. Don’t miss your chance to eat all of the savory and sweet treats that Disneyland has to offer. 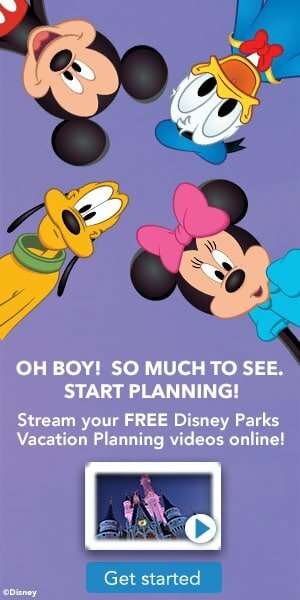 You can book your 2018 Disneyland vacation with Get Away Today at getawaytoday.com or call 855-GET-AWAY to speak to a travel expert directly. Make sure to take advantage of their Layaway Plan, which allows you to book your vacation dreams for just $125 down. Plus, use promo code THRIFTYNW to get an extra $10 off your vacation package. That’s extra money that you can use on one of these delicious meals instead. Make sure to mention that Thrifty Northwest Mom sent you!